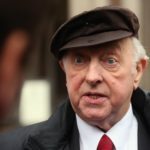 Arthur Scargill is a British trade unionist. He was President of the National Union of Mine workers (NUM) from 1982 to 2002. Joining the NUM at the age of nineteen in 1957, he became one of its leading activists in the late 1960’s. He led an unofficial strike in 1969, and played a key organizing role during the strikes of 1972 and 1974, the latter of which helped in the downfall of Edward Heath’s Conservative government. "Yet what you need is not marches, demonstrations, rallies or wide associations, all of them are important. What you need is direct action. The sooner people understand that, the sooner we’ll begin to change things." "All too often miners, and indeed other trade unionists, underestimate the economic strength they have." "The trouble with the Labour Party leadership and the trade union leadership, they’re quite willing to applaud millions on the streets of the Philippines or in Eastern Europe, without understanding the need to also produce millions of people on the streets of Britain." "There’s a feeling that strength is determined by the size of a union. That clearly is nonsense."